I love the Christmas season. The smells, the sounds, the traditions...it really is the Most Wonderful Time of the Year. But this year, the season has become even more special as Brian and I introduce Alexandra to so many wonderful Holiday traditions we enjoyed as kids. For me, it was just a time when my parents house was filled with family, friends and an absurd amount of delicious food...all while Nat King Cole crooned in the background. The start of any good holiday begins with a perfectly dressed holiday table. Making a table beautiful can become very expensive, but this year I put this entire table together using wares I found in Target and mixing in stuff I already owned. 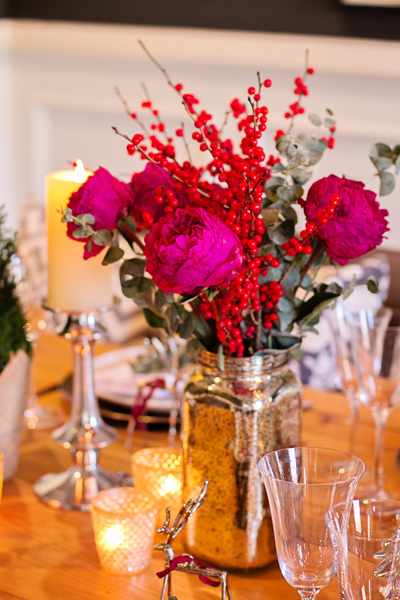 Instead of the classic red and green, I opted for pops of pink, gold and silver for a little unexpected twist. I started with a gold lacquered charger which looks expensive with it's hammered edges, but is really plastic! And a little over 2 bucks each! I topped with a plain white plate from my everyday collection and a mercury glass salad plate on top. Mixing metallics is one of my favorite things to do, don't be afraid - Gold and Silver definitely go together! I folded a crisp white napkin, and wrapped it with gold striped ribbon for a timeless look. A small cutting of red berries and fresh eucalyptus topped off my gorgeous place setting. I filled two large gold sprayed mason jars with fresh flowers I found at Whole Foods that morning. Fuchsia peonies? YES please!! What an amazing mix of colors. I love how these arrangements mix classic colors with a pop of unexpected color. Just perfect. No table is complete without a ton of candles and candlelight. Target to the rescue again. These silver mercury glass pillar candle holders were the perfect addition and will be on top of my table for years to come. Remember to always use different height candles for added interest and dimension to your table. Small votives are a fantastic way to do just that. 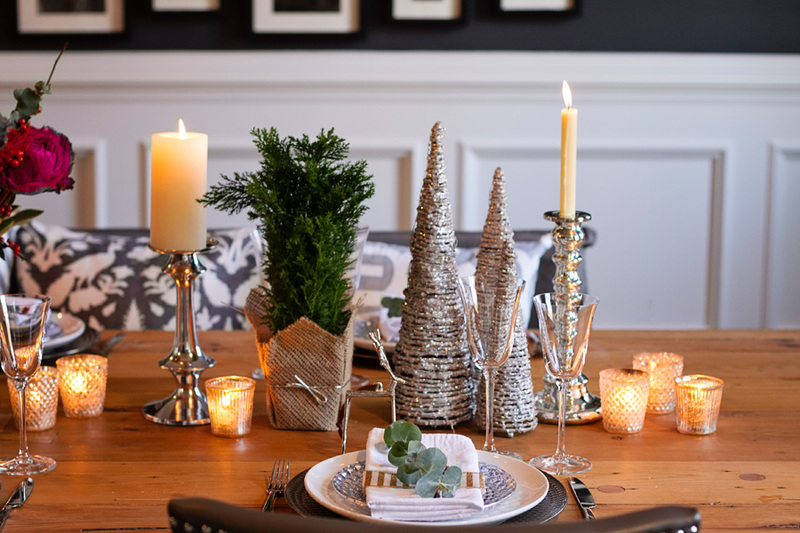 I love Christmas decor that doesn't scream Christmas so I was thrilled when I found these silver wicker Christmas trees. They provided just the right amount of height and sparkle to the table. I always balance my tablescapes, so two trees went on either side of the centerpieces. Each guest's seat was marked with a small silver reindeer ornament. I tied a Merry Christmas gift tag on each and wrote each guests name in gold marker. The perfect table card and holiday gift in one! I love to give ornaments at Holiday time. Every year when I decorate my tree I love to reminisce at the story of each of my ornaments. Such a wonderful way to remember good times spent with family and friends. After a sit down meal, I love to serve dessert buffet style so my guests are up and mingling. This year I decided to incorporate my desserts into the Christmas village I always set up in my living room. How perfect was this backdrop? And the best part? It took me 3 minutes to setup!! Just the type of dessert table I like. One new tradition I started this year was giving Alexandra a Christmas tree of her own. Is this not the cutest little tree ever? And I found the most adorable princess ornaments that Alexandra was absolutely obsessed with. Plastic of course :) It was so nice that she had a tree that she could actually touch without getting hurt or breaking something! And because she is allowed to play with this tree, she really left our big tree alone! A win win. This Holiday season I plan on taking time to enjoy good food, good wine and good memories with the people I love. Merry Christmas and Happy Holidays from Little Miss Party Planner! A Big thank you to Karilyn Sanders for the gorgeous pictures!